Imagine if children only learned the letters A-G or to count 1-10. Their ability to perform fundamental tasks required to be contributing members of society would be extremely hindered. So why is it acceptable that a large percentage of our children lack the ability, or the confidence, to perform basic movement skills that are essential to moving, living, and participating in life? In the U.S. alone we spend over $305,100,000,000 a year on obesity-related disease. A recent study out of Johns Hopkins Bloomberg School of Public Health’s Global Obesity Prevention Center found that if all 8-11 year olds in the U.S. did 25 minutes of exercise even three times a week it would prevent $62.3 billion in medical costs and lost wages during their lives and 1.2 million fewer youngsters would be overweight or obese. The time for action is now. The National Association of Physical Literacy (NAPL) is on a mission to change the health and well-being of children around the globe. Physical Literacy is the ability, balance, confidence, desire, and explorative nature to be active for life. To be physically literate, children need to be taught how to perform basic movement skills such as running, jumping, throwing, catching, and swinging. Without the ability to perform these basic movements it is difficult for children to go on to pursue more complex athletic endeavors whether it be soccer, basketball, or even a neighborhood game of tag. Children who lack this simple foundation struggle to stay physically active and are therefore at greater risk for obesity and poor health outcomes as they grow. That is primarily why 70% of kids drop out of youth sports by age 13. To create a sustainable, physically literate culture, NAPL provides tools, including online and in-person training, curriculum, certification, and step-by-step guidance for all stakeholders. NAPL recognizes the demands placed on teachers, administrators, coaches, and childcare providers, and its training offers a blend of nutrition education, play-based movement, and self-regulation skills that can be infused into existing curriculum throughout the day. Programs are designed to be portable and adaptable by fitting directly into the constraints of any school or community environment. We want all participants to be prepared to shape physically literate children who are better equipped to live more active, healthier lives. Trainings are presented to fit the customized needs of each school or organization. Most sites begin with a two-hour video training that introduces the concept of physical literacy and immerses participants in the NAPL philosophies of “food as fuel,” “sport as play,” and “mindfulness as happiness.” Training participants are familiarized with sample curriculum, which is then delivered electronically quarterly. Curriculum is grade appropriate and seasonally focused for fall, winter, spring, and summer. There is a cooking and gardening curriculum and a sport- sampling curriculum. All lessons are tied to Common Core State Standards. Every lesson includes a social emotional learning component so that it becomes common practice for students to identify their emotions and find coping skills to manage how they react. When everyone in a school or organization is using a common language around physical literacy children become more receptive to embracing the concept as a way of life. Additional physical literacy training for parents and caregivers can create a powerful support community and get entire families involved in a wellness adventure that positively impacts an exponential number of people. NAPL works with schools before, during, and after the school day, as well as with after school programs to help build physical literacy into students’ lives. 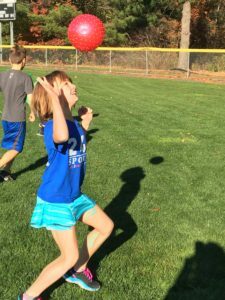 NAPL teacher trainings and curriculum were introduced at Grace Academy in Hartford, Connecticut in January 2017 with a commitment to help Grace Academy’s students develop their athletic abilities and skills, along with implementing an overall nutrition and wellness plan. Grace Academy is a comprehensive educational program for urban middle school girls in fifth through eighth grades, providing them with an opportunity to experience a tuition-free, college-preparatory education in an atmosphere of respect and responsibility. Grace Academy prides itself on its cutting-edge approach to education and its integration of physical literacy has been one more way the students and the community benefit from the school’s commitment to developing outstanding citizens. 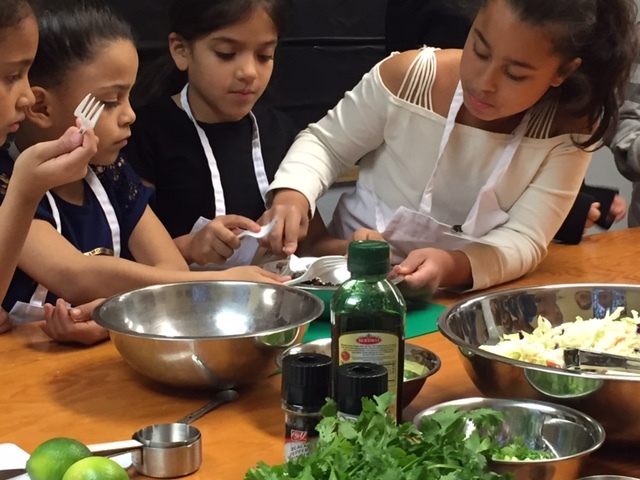 Students participate in hands-on cooking lessons during lunch four days each week. The lessons highlight simple, healthy snacks and meals that students can prepare at home. 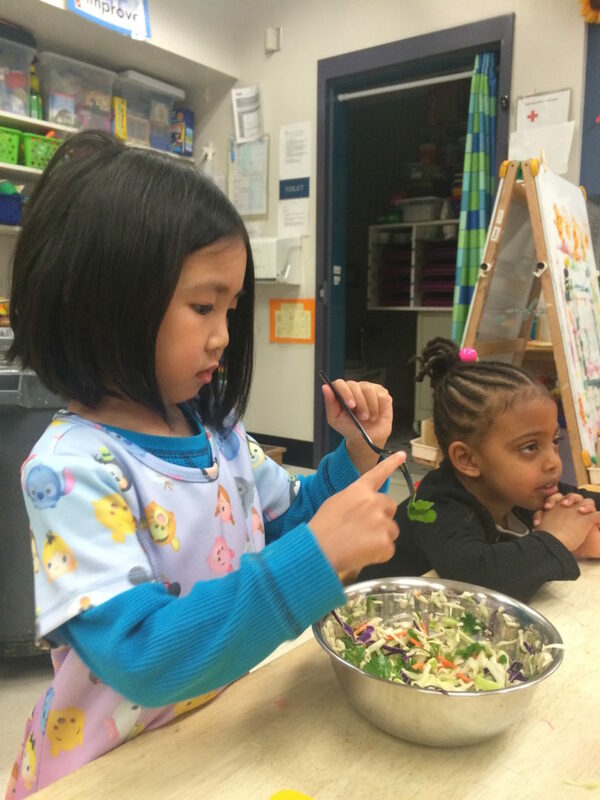 Instructors address where food comes from, how it grows, and the cultural aspects of food, as well as teach nutrition education and the importance of properly fueling our bodies. The most popular aspect of the lesson is when students sit down to taste the fruits of their labor at the end of class. In addition to cooking, students gather four days each week after school for “PLAY” where they learn basic movement skills and participate in sport sampling. Many of the students have never had an opportunity to learn to throw a ball or play an organized game with other children. During this past spring, students worked with NAPL coaches to organize a softball team, the first ever sports team at the school. The coaches arranged a game against another school near the end of the year. When the Grace Academy team actually won the game there was never a sweeter victory. The experience for the girls on the team was invaluable and built their confidence in a way that would not have been possible without NAPL’s program. Over 500 kids gather every day after school at the Bristol Boys & Girls Club (BBGC) in Bristol, Connecticut. The afternoon begins with the academically focused Power Hour, which is kicked off with a BrainErgizer™. For the next five minutes, the kids are glued to the screen as they follow the video and shoot imaginary basketballs through hoops, swing make-believe rackets at forehand shots, and do tae kwon do kicks. Finally, they re-center themselves and become mindful in a yoga tree pose. The BrainErgizer™ ends and they are now energized and more focused as they do their work. 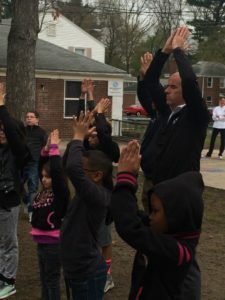 Providing children with basic skills to understand how food, movement, and mindfulness impact their overall well-being helps them recognize the connection between mind and body wellness. The outcome is well-rounded, physically literate children that are active for life. Susan Kamin is a registered dietitian and the chief wellness officer for the National Association of Physical Literacy. Susan previously worked in child wellness as executive director of Growing Great Schools, a nonprofit committed to creating a culture of wellness by working with children and families. She is a member of the Academy of Nutrition and Dietetics and the Sports, Cardiovascular, and Wellness Nutrition practice group. Susan strongly believes that our bodies are only as good as what we put in them. She loves helping kids figure out how to excel at whatever they are passionate about by using the right fuel and keeping balance in their lives.